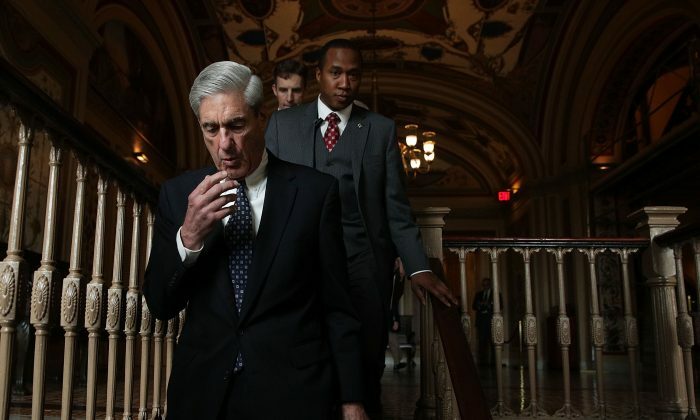 Special counsel Robert Mueller and his team may face widespread conflicts of interest as evidence mounts that their current and former colleagues at the FBI and the Department of Justice (DOJ) were behind unsavory attempts to damage the candidacy of Donald Trump. Mueller was appointed on May 17, 2017, to investigate the Kremlin’s efforts to interfere in the 2016 presidential election, including any links or coordination between the Russian government and the campaign of then-candidate Donald Trump. Mueller took over a previous FBI investigation into Trump-Russia links, but the validity of that investigation has been crumbling under a growing pile of evidence that there may have been no credible reason to launch it in the first place. Mueller has so far spent about $17 million, hiring 17 lawyers and using a host of other DOJ personnel and resources. One team member, James Quarles III, donated $2,750 to Republicans, but he also donated close to $40,000 to Democrats. It’s not clear why he gave $2,500 to Republican Rep. Jason Chaffetz while also giving some $13,000 to Clinton and Obama, since Chaffetz was a vociferous Clinton and Obama critic and opposed them on virtually every issue. Another team member, Andrew Weissmann, used to be general counsel to the FBI under Mueller. He also attended Hillary Clinton’s election night party. He has given $10,000 to Democratic candidates, including nearly $5,000 to Obama. Team member Jeannie Rhee represented Hillary Clinton and the Clinton Foundation in two 2015 lawsuits. She also gave $5,400 to Clinton’s campaign. Aaron Zebley seems to have made no campaign donations, but he was FBI chief of staff under Mueller and worked at the DOJ’s national security division. He also represented Clinton IT staffer Justin Cooper, who installed Clinton’s private email server—the core of the FBI probe into her mishandling of classified information. Even relatively unknown names on the list seem to be aligned with left-leaning agendas. Adam Jed, a DOJ Civil Division appellate attorney, was the one who defended Obama’s Affordable Care Act, according to Law.com. Brian Richardson, likely the most junior member of the team, was picked up by Mueller after clerking for the left-leaning Supreme Court Justice Stephen Breyer. Zainab Ahmad, one of the few on the team with no known party affiliation or campaign donations, was promoted by Obama’s Attorney General Loretta Lynch only months before the 2016 election, according to the New Yorker. Her specialty was prosecuting terrorism suspects in civilian courts—a practice opposed by Trump’s Attorney General Jeff Sessions, who prefers military trials for terrorists. Mueller himself has been described as Republican in the past. He’s a former Marine and Vietnam veteran who served as U.S. attorney, assistant attorney general, and then FBI director until 2013. His lifetime of service in the DOJ and FBI served to initially give credibility to the special counsel investigation, but are now becoming a vulnerability since his fellow public servants came under the crosshairs of investigators. Based on leaks to The New York Times, the FBI Trump-Russia investigation started on July 31, 2016, after Australians had passed intelligence to the FBI earlier that month about a drunken conversation between volunteer Trump campaign adviser George Papadopoulos and the top Australian diplomat in Britain, Alexander Downer. But that rationale has fallen apart with the revelation that FBI informant Stefan Halper was already in contact with the Trump campaign before that date. Moreover, the man who was supposed to tell Papadopoulos about Russian’s having “dirt” on Clinton had extensive ties to Western intelligence. In addition, text messages sent between top FBI officials Peter Strzok and Lisa Page suggest that the FBI initiated an offensive counterintelligence operation against the Trump campaign as early as December 2015. Strzok and Page were initially part of the Mueller team but Strzok was kicked out after the texts emerged, showing his and Page’s extreme bias against Trump. Page left the Mueller team on her own before the texts emerged. She quit the FBI in May. Last week, The Epoch Times laid out how a select group of Obama-administration officials orchestrated an expansive spy operation against the Trump campaign that included national security letters—a type of secret subpoena—Foreign Intelligence Surveillance Act (FISA) warrants, at least one spy, the unmasking of American citizens in intelligence reports, and spying conducted by foreign intelligence agencies. A large amount of information obtained through the operation was illegally leaked to certain media. Both the DOJ inspector general and the House intelligence committee are currently probing the officials involved and why they launched the operation. Several officials have already been referred for criminal investigation. A group of congressmen demanded an investigation on former FBI Director James Comey, former FBI Deputy Director Andrew McCabe, former Acting Attorney General Sally Yates, and former Acting Deputy Attorney General Dana Boente over their roles in signing a FISA warrant to surveil Trump campaign volunteer adviser Carter Page. The lawmakers accuse the four officials of depriving Page of his rights and of investigative misconduct. The FISA warrant relied heavily on the Steele dossier, put together by Christopher Steele, a former MI6 British intelligence agent, using second- and thirdhand sources close to Kremlin. The dossier was characterized as “salacious and unverified” by Comey. Steele was paid by the Clinton campaign and the Democratic National Committee. While Mueller and his team were praised as perfectly qualified to look into Russian interference into U.S. elections, every Trump-Russia link seems to curve back to the Obama administration or Clinton—the very ones most of Mueller team worked for and supported.